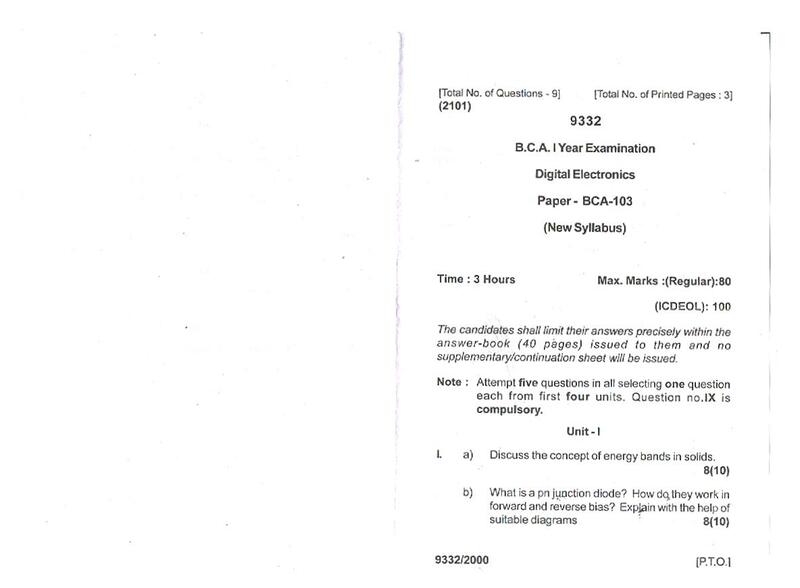 The candidates shell limit their answers precisely within the answer-book (40 pages) issued to them and no supplementary/continuation sheet will be issued. 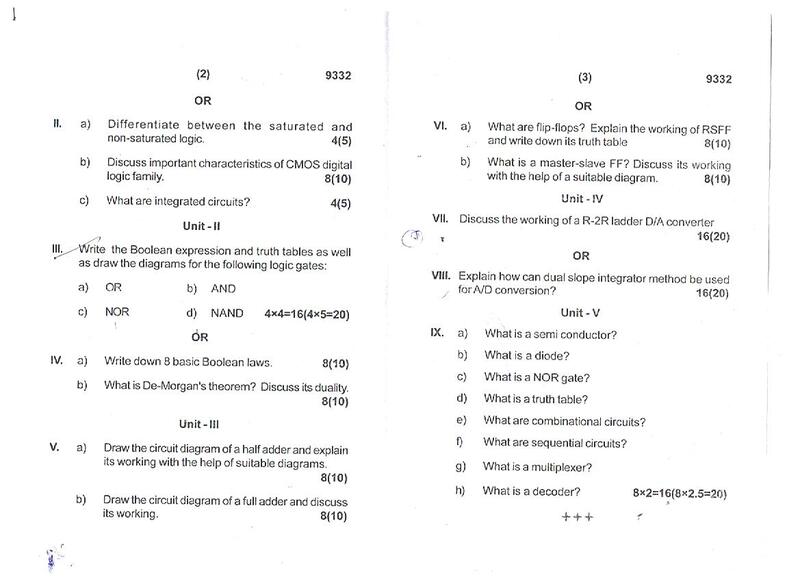 Note : Attempt five questions in all selecting one question each from first four units. 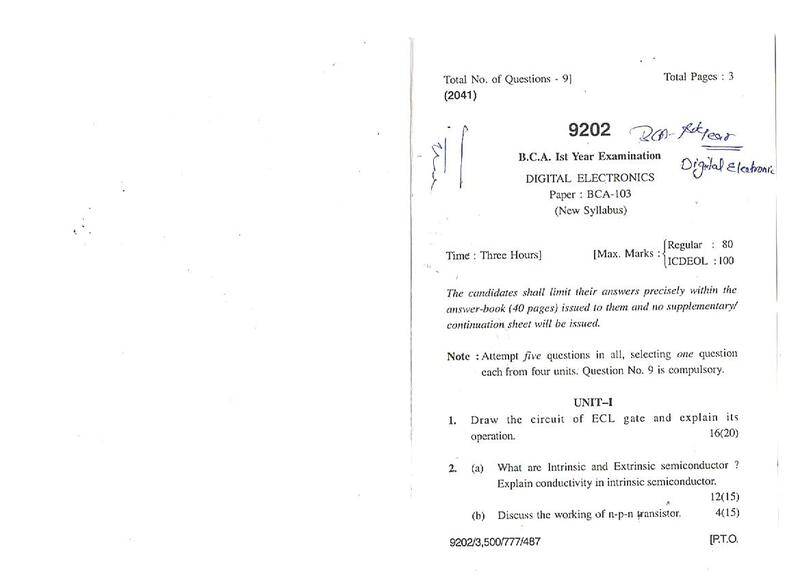 Question no.IX is compulsory. I. a) Discuss the concept of energy bands in solids. b) What is De-Morgan's theorem? Discuss its duality. its working with the help of suitable diagrams. IX. a) What is a semiconductor? b) What is a diode? c) What is a NOR gate? d) What is a truth table? e) What are combinational circuits? f) What are sequential circuits? g) What is a multiplexer? (a) The Total Sales Book page, Rs. 12,136 was carried forward as Rs. 12,100. (b) An item in the sales return book of Rs. 408 relating to Z was posted to his account as Rs. 588. (c) A chcquc of Rs. 1,000 entered as cash sales on 31st Dec. was not posted to Sabs Account. (d) Depreciation of Plant at 10% on Rs. 15,440 has been credited to plant account, there being no corresponding debit. (e) An item of Rs. 19 appearing in the debit discount column of the Cash-Book representing discount allowed to B had been posted to the debit of C.
3. Distinguish between Trading and Profit and Loss Account. Give a specimen of trading and profit and loss account with imaginary figures. Rs. 2 per share on application; Rs. 5 per share (Including Premium) on allotment; Rs. 2 per share on first call; Rs. 3* per share on final call. Application for 30,000 shares were received. Allotment was made pro-rata to the applicants for 24,000 shares, the remaining applications being rejected. Money overpaid on application was utilised towards sum due on allotment. Shri Y to whom 800 shares were allotted failed to pay the allotment money, fust and scconds calls money and Shri Z to whom 1,000 shares were allotted failed to pay the last two calls. These shares were subsequently forfeited after the second call was made. All these forfeited shares were reissued to Shri W as fully paid-up at Rs. 8 per share. Give the necessary journal entries to record the above transactions. The candidates shall limit their answers precisely within the answer-book (40 pages) issued to them and no supplementary/ continuation sheet will be issued. Note : Attempt five questions in all, selecting one question each from four units. Question No. 9 is compulsory. 2. (a) What arc Intrinsic and Extrinsic semiconductor ? Explain conductivity in intrinsic semiconductor. 3. Explain the laws related to Boolean Algebra. , (i) Sum of product (SOP). (a.) A-f A.B+A.B = A + B. (b) Comparison of Analog Versus Digital. (d) Advantages of CMOS over Bipolar tech.